My last wash day was a bit of a disaster. Many of you told me that the Shea Moisture Deep Treatment Masque can be hit or miss. It is definitely a miss for me. They have other great products. My plan for this wash day was to go back to basics and do the things that I KNOW work well for my hair. No experimentation this time. Here’s how things went. (1) Scalp massage with a mixture of neem oil, Lavender JBCO, tea tree and eucalyptus essential oils. (2) Sectioned into four and coated hair with a mix of coconut and hemp seed oils. Detangled each section with a wide-tooth comb. (3) Applied Organics by Africa’s Best Cholesterol and Tea-Tree Oil Conditioner, Vatika Naturals Hot Oil Treatment conditioner, olive oil, and glycerine (1 tsp each) to each section. Cover with a plastic cap and a towel. Left on for 45 minutes. (4) Rinsed out pre-poo. Washed twice with diluted Crème of Nature Argan Oil Shampoo. (5) Tea rinse with hibiscus powder, green tea, and black tea that was steeped for about 12 hours. I made sure to filter the rinse this time. Left on for 5 min and rinsed with cool water. This rinse was better this time because the extra powder was filtered out. (6) Towel dried for about 10 minutes. Applied Profectiv Mega Growth Deep Conditioner to my ends, edges, and nape. Deep conditioned with Crème of Nature Argan Oil Intensive Conditioning Treatment, olive oil and castor oil. Kept under heat for 45 minutes. (8) Applied leave-ins (Infusium 23 + Giovanni Direct Leave-in) and detangled. I used Mane n’ Tail Detangler for very tough tangles. I noticed some matting. It seems like my hair meshed together after washing. I may start washing my hair in braids. (9) Roller set hair. Allowed to dry for 1 hour with my hooded dryer on medium heat. I left the rollers on over night. (11) Used my Roots Only bottle to apply JBCO mix to my scalp. I massaged it in briefly. I have a happy head of hair. My hair felt very soft after deep conditioning and even softer in the morning. This was so much better than last week. My co-wash also helped with moisture levels and this wash has set it over the top. I’m not sure why my new growth is matting. Roller setting really helps with that. I still notice some breakage but I don’t think it is as bad as before. My hair feels really nice these days so I can’t complain. How was your wash day? 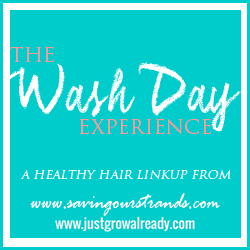 To read more healthy hair wash day posts, check out The Wash Day Experience. It’s always nice to have a tried and tested routine to rely on! Thanks! Tried and tested for the win. Thanks! My hair and I are happy too. Shout out to the products that you KNOW your hair loves. Your ends look really smooth—I bet its from the dusting that you’ve been doing. Which reminds me that I need to do the same soon! My end feel pretty good too. Previously, I would never trim and then end up having to cut off so much hair. 🙁 Now, I’m trying to be consistent with my dusting to help my ends. Awesome post – I also love a good wash day where everything just works!